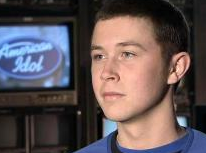 GARNER, N.C. — Scotty McCreery's road on 'American Idol' has been rocky, but it isn't over yet. The 17-year-old from Garner was named to the top 24 on Thursday night. This area is proving to be rich in reality TV contestants. How can you not love Rachel Maddow? Miracle Koran baby in hiding. RIP: Nicholas Courtney, Doctor Who's "Brigadier"
"Everybody is a genius ... "
Pictionary FAIL/WIN on Fallon last night. Whatever happened to Jake the Snake?